Download Client You always may check a voice quality on the demo server. 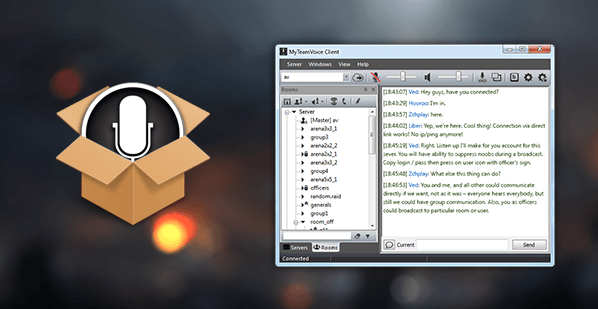 MyTeamVoice PC client application allows you connecting to MyTeamVoice voice service. By using it you would be able to communicate with your friends / team by voice and text. Unicode support for nicks, rank names, room names. Extended a list of user states icons, improved behavior. Main menu rearrangement and behavior improvements. Improved validators for input fields. Fixed interface repainting and reduced flickering. Fixed Room’s toolbar behavior related to displaying tools set according to user rights and state. Left/right keys collapse/expand room in tree. Added button "Find myself" in a room tree. Fixed crash related to room creation from context menu. Changed behavior of Mute / Unmute all listeners: button is set to unmute only if all listeners muted. Added new listener does not take into account "Mute / Unmute all listeners" flag state. Improved behavior and bugs fixes. New chat fixes selection and scroll position if new lines appears (to read or copy messages). Starred servers saved between client’s sessions. Added separate dialog to connect by URL. Added special notification when microphone is muted or output volume is set to 0. Added special warning on trying to use more than one PTT at the same time. Improved and bug fixes of PTT and Smart PTT functions. Fixed bugs of Fading option. Fixed problem with warning and information overlay text colors. Overlay text size is now limited. MOTD now do not have size limits. Added sort function to tables. Fixed problems related to incorrect saving of text data. Now bindings uses user local date-time for server bindings. New sound for system alerts. Now Client restores microphone settings when client releases the device. Fixed problems related to media devices. Extended a list of games which overlay is supporting. Made visual improvements to overlay windows. Now overlay shows users’ ranks. Added a mode that will show a listened room’s name when someone talks there. Fixed bugs which made overlay blinking. Fixed bugs which slowed down updates of users’ states. Now users may change rooms from overlay window. Removed user’s icon doubling on using Smart PTT functions. Improved processing of hotkeys and fixed related problems. Fixed problems with text input in overlay chat and other applications. Extended support of DirectX 10 and 11, fixed related problems. Fixed processing of chat commands /r, /w.